Have you seen the superior performance of the F-150 Raptor? 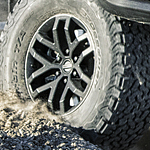 Most people don’t realize that this design is one made special for the off-road adventurers who also like economical trucks. The design of the Raptor is definitely for high-speed fun and off-roading. You’ll be able to grip any rough terrain with BF Goodrich All-Terrain KO2 tires, but it’s the headlamps and new grille refresh that have made drivers start looking at the Raptor as more than a novelty truck. This truck also has new power with a brand new engine. The twin turbo V6 engine can get up to 450 horsepower and accelerates quickly on any roads. You’ll be able to drive comfortably and seat up to five people in the spacious cabin. There are also several new technology features, such as SYNC 3 connectivity and an 8-inch touch screen LCD display. Want to check out the Raptor in person? Get the experience and put the pedal to the metal with the latest Raptor at First Choice Ford.